5. Admission Test date: 14 December, 2018 at Friday 10:00am. a. Who Passed SSC or equivalent examination in Science Group in the year 2015 or 2016.
b. Who Passed HSC or equivalent examination in the year 2017 or 2018 with at least CGPA 3 in each of Physics, Chemistry, Mathematics and Biology. c. Securing a minimum GPA 3 in each of S.S.C and H.S.C examinations but combined GPA should be at least 7.0.
d. Candidates passed GCE ‘O’ level and ‘A’ level; at least ‘B’ grade in 5 papers in ‘O’ level and at least ‘B’ grade in Physics, Chemistry, Mathematics and Biology in ‘A’ level. 2. Click Menu button "Admission Test 2019"
3. S.S.C/Equivalent and H.S.C/Equivalent Board Name, Roll Number and Registration No. 4. Click Next and Please check your Information. 5. Please type your Mobile number and Do you have any Quota, please select anyone. Select your examination language. 6. Please check your information and press confirm button. 7. Complete the payment in DBBL mobile Banking and SureCash. c. Select 4 for Payment. e. Input 1000 as Amount. b. Select 1 for Bill Pay Option. c. Select 3 for Payment Option. e. Enter Bill Number/Application ID which Provide you just, after Online Application. Bill Number Means your Application ID. 2. Question Type is MCQ. 3. For Each Wrong Answer 0.25 Marks will be deduct. 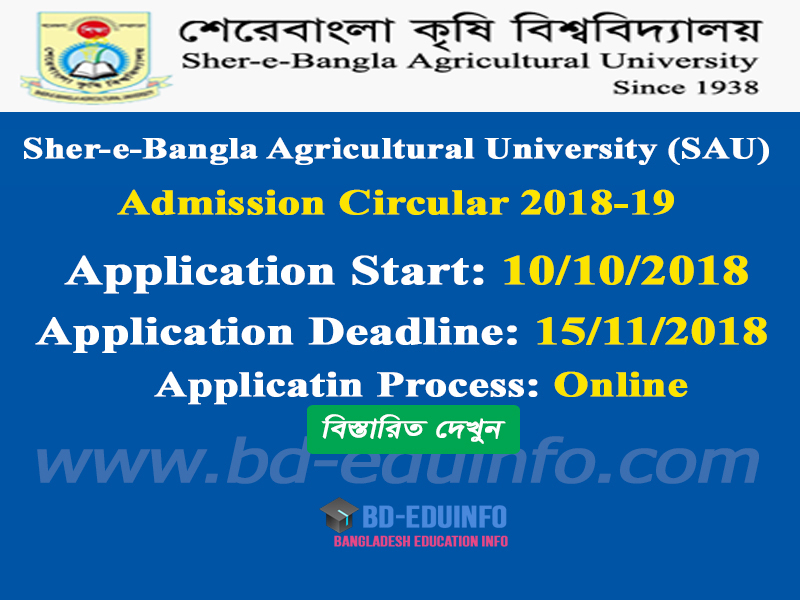 Sher-e-Bangla Agricultural University (SAU) 21 November 2018 to 27 November, 2018 can Download Admit Card. You can download http://www.sau.edu.bd/ use ID No. Sher-e-Bangla Agricultural University (SAU) Test Examination Seat Plan Admission authority will published http://www.sau.edu.bd/ and Inform Applicant Mobile SMS. 13 December, 2018 will published Admission Test Result. 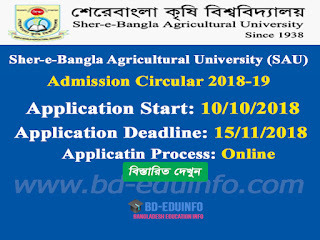 Any applicant can download and view from Sher-e-Bangla Agricultural University (SAU) Admission Official website http://www.sau.edu.bd/ search their Admission Test Roll Number. 13 December, 2018 will published Admission Test Waiting List Result. Any applicant can download and view from Sher-e-Bangla Agricultural University (SAU) Admission Official website http://www.sau.edu.bd/ search their Admission Test Roll Number. Tags: sau cloudonebd com, Sher-e-Bangla Agricultural University (SAU), Sher-e-Bangla Agricultural University (SAU) Admission Circular 2018, Sher-e-Bangla Agricultural University (SAU) Admission Test Result 2017-2018, SAU Admission Circular, SAU Admission Notice, SAU Admit Card Download, SAU Seat Plan, SAU Admission Mark Distribution, Sher-e-Bangla Agricultural University (SAU) Admission Test Mark Distribution, SAU Admission Test Result. sau cloudonebd com, Sher-e-Bangla Agricultural University (SAU), Sher-e-Bangla Agricultural University (SAU) Admission Circular 2018, Sher-e-Bangla Agricultural University (SAU) Admission Test Result 2017-2018, SAU Admission Circular, SAU Admission Notice, SAU Admit Card Download, SAU Seat Plan, SAU Admission Mark Distribution, Sher-e-Bangla Agricultural University (SAU) Admission Test Mark Distribution, SAU Admission Test Result.